Hi! Just a quick share today. 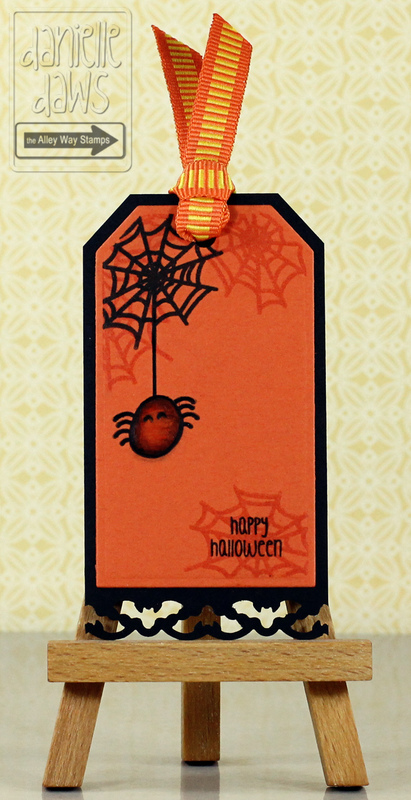 Halloween isn't widely celebrated in Australia, but I couldn't resist making a Halloween tag with the cute spider and web from Cover Ups from The Alley Way Stamps! I love how the webs turned out in black ink and Versamark. I used Bazzill Card Shoppe cardstock in Candy Corn and Licorice Twist, and I used Prismacolor pencils to colour the spider. The ribbon is 3/8" Orange/Yellow Grosgrain Horizontal Lines Ribbon from the Ribbon Carousel. This is a super tag DD. Love the bottom - is it punched? Too cute! Awesome 'bat' edge!